Item No: 98257 Dimensions(in): W 8.9 x H 9.0 x L 8.9 The Amarillite Ceiling Lamp is straightforward yet exquisite. Made of antique black gold and brass with a 40 watt bulb. 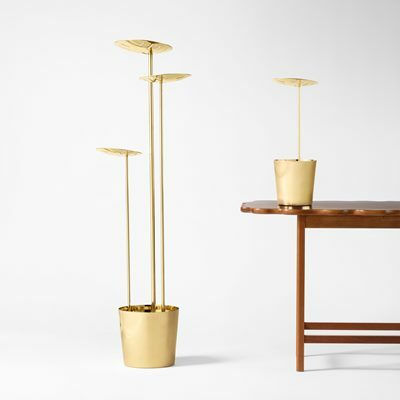 If the art deco era birthed a blooming flower, it would look like this lamp. Item No: 98255 Dimensions(in): W 5.9 x H 10.0 x L 5.9 For Alcatraz Island chic, try the Aragonite Ceiling Lamp. A hanging black and copper cage encloses a sleekly voluptuous 40 watt bulb. Hang it over a craft table or a breakfast nook and be glad you’re not on the inside. Item No: 50208 Dimensions(in): W 9.0 x H 10.6 x L 9.0 Confidence ceiling lamp is made of faux concrete with contrasting red accents woven though shade giving the look of sewn layers. Suspended by wire and grey electrical cord. Install in kitchen or bar areas, kids rooms or restaurants and bars to add a fun industrial look. Bulbs not included. Bulbs sold seperately, Max Watt 60 W, Size E26, Type A19. UL approved and listed. 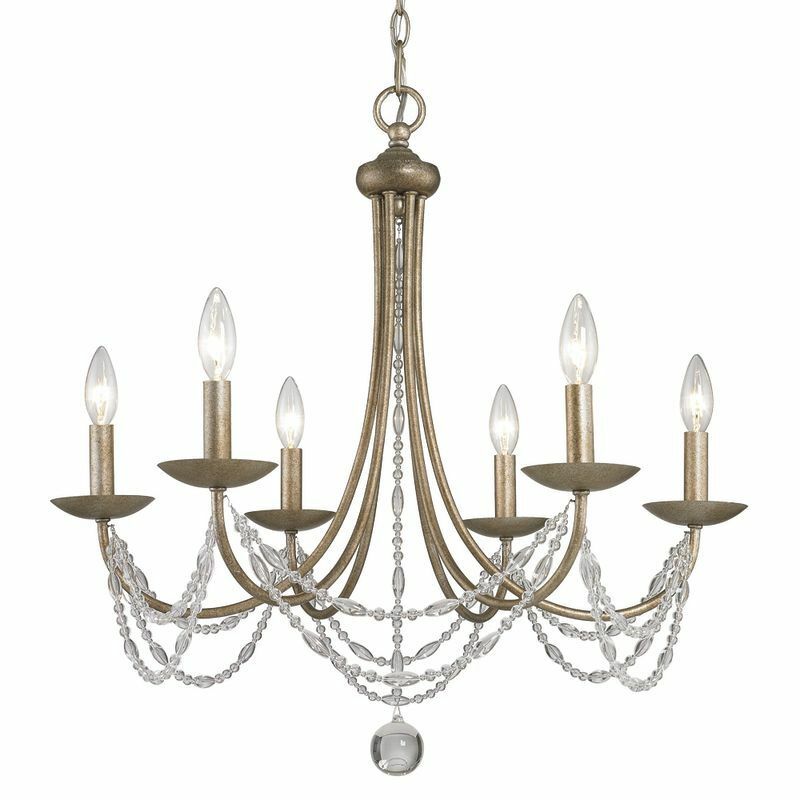 Item No: 56068 Dimensions(in): W 23.6 x H 74.0 x L 23.6 Bands of metal intertwine to create this gorgeous orb chandelier. Perfect for your most elegant and visible spaces, it will make a design statement floating over a dining table or hanging in a bedroom or entry space. Open-air design will illuminate any room. 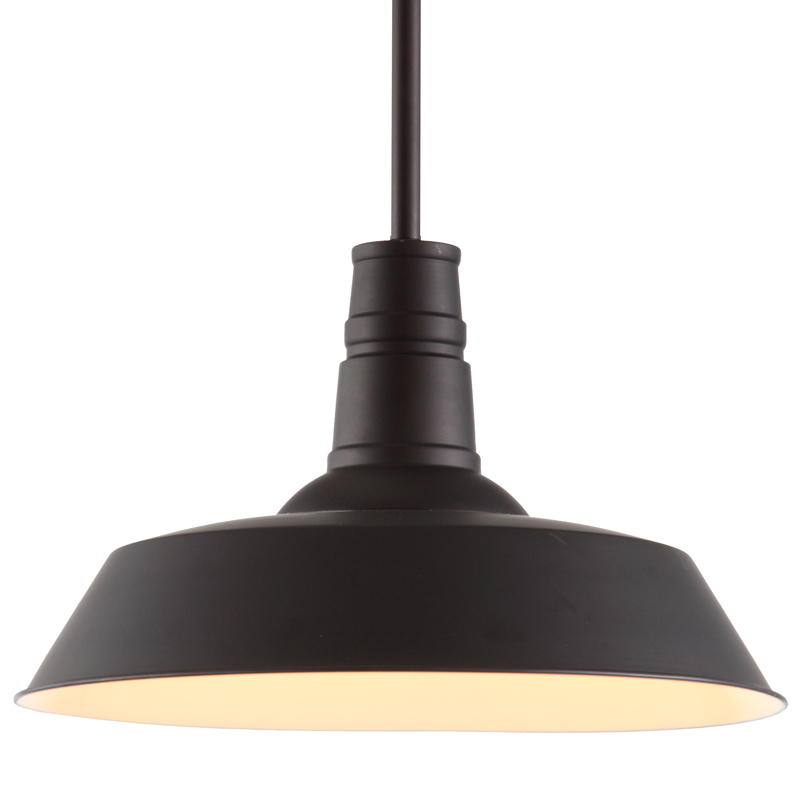 Aspiration ceiling Lamp features a classic bowler hat style. Black felt hat has ribbon details and .. Item No: 98237 Dimensions(in): W 19.7 x H 61.0 x L 19.7 Like a space probe from the mid-century space race, the Sapphire ceiling lamp’s aged patina and oversized bulbs gives an industrial salute to the big race. Bulbs not included, Matt Watt 25 W E26 Type T45 Edison. UL approved and listed. Daydream ceiling lamp has a large 2 level bell shaped shade. Shade material surrounds a metal archi.. The Galileo Ceiling Light is an intriguing optical illusion. Like a perfect sea shell, swirling lin.. Item No: 98230 Dimensions(in): W 34.8 x H 35.0 x L 8.6 Operating on an ingenious synchronized pulley system, the Agate ceiling lamp moves up and down or side to side at a touch. The lamp comes with two 60w bulbs and is UL approved. Hope ceiling has a classic bell shape with warm white finish. Perfect for kitchen, dining or restaurant applications for a modern take on a classic design. Bulbs not included. Bulbs sold seperately, Max Watt 100 W, Size E26, Type A19. UL approved and listed. Like a blossom opening from a branch, the Tachyon Ceiling Lamp is harmonious sophisticationand made.. Item No: 56051 Dimensions(in): W 18.9 x H 2.6 x L 18.9 This floating pendant light is minimal in design and sleek in style. Its circular outer band in matte black metal provides a simple silhouette that works with any décor. Suspend it over a kitchen island or dining table to create an elegant glow. Item No: 98242 Dimensions(in): W 30.7 x H 90.5 x L 30.7 Classic triangular forms create the beautiful symmetry of the Amethyst ceiling lamp. Constructed of sturdy steel in an industrial finish with an aged patina. Bulbs not included. Bulbs sold seperately, Max Watt 40 W, Size E26, Type ST64. UL approved and listed. It’s a modern marvel. Clear glass spheres of light extend dramatically from the corners of this hex.. Item No: 50500 Dimensions(in): W 11.8 x H 16.7 x L 11.8 Vigor table lamp has contemporary styling with warm beige shade and a soft grey faux concrete base. Add to bedrooms or offices, lobby’s or hotel guest rooms for the perfect touch of warmth sincerity. Bulbs not included, Matt Watt 60 W E26 Type A19 Frosted White. Operating on an ingenious synchronized pulley system, the Agate ceiling lamp moves up and down or s.. Item No: 50205 Dimensions(in): W 7.9 x H 9.6 x L 7.9 The Fortune ceiling lamp is made of of light-weight faux concrete in a sleek pint sized shape. Faux concrete finish is in a warm grey tone outside and inside of shade. Install alone for a industrial look for kitchen or bar areas or hang several in restaurants. Suspended wire with black mounting fixture and finished with black electrical cord. Bulbs not included. Bulbs sold seperately, Max Watt 60 W, Size E26, Type A19. Item No: 50214 Dimensions(in): W 59.0 x H 51.0 x L 59.0 The Ambition ceiling lamp stuns with a bold angled black frame and tubular shades accented inside with gold foil. Perfect for entry, dining or living rooms; lobby, conference or boutiques. Bulbs not included. Bulbs sold seperately, Max Watt 15 W, Size E12, Type G45. UL approved and listed. Item No: 98238 Dimensions(in): W 40.0 x H 68.9 x L 40.0 Like a space probe from the mid-century space race, the Sapphire ceiling lamp’s aged patina and oversized bulbs gives an industrial salute to the big race. Item No: 50210 Dimensions(in): W 21.0 x H 13.8 x L 21.0 Paradise ceiling lamp has a large dome shaped shade. Shade material surrounds a metal architecture with an grey polyester woven thread zig zag pattern woven throughout creating a soft, see through shade. Install in kitchens and dining rooms, restaurants or day spas for a softer look to your modern design. Bulbs not included. Bulbs sold seperately, Max Watt 60 W, Size E26, Type A19. UL approved and listed. Confidence ceiling lamp is made of faux concrete with contrasting red accents woven though shade gi..
Paradise ceiling lamp has a large dome shaped shade. Shade material surrounds a metal architecture .. Item No: 98241 Dimensions(in): W 21.3 x H 80.7 x L 21.3 Classic triangular forms create the beautiful symmetry of the Amethyst ceiling lamp. Constructed of sturdy steel in an industrial finish with an aged patina. 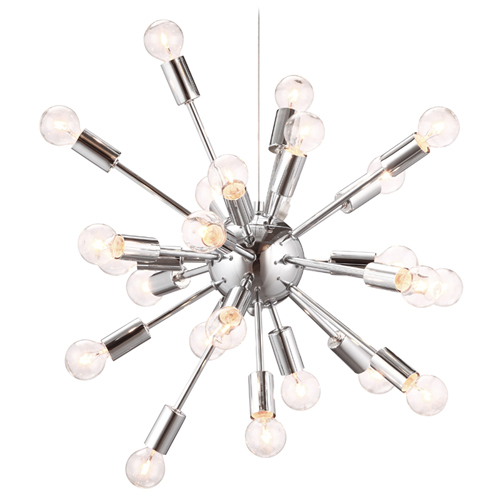 Like a space probe from the mid-century space race, the Sapphire ceiling lamp’s aged patina and ove.. Item No: 50216 Dimensions(in): W 59.0 x H 78.7 x L 59.0 Belief ceiling lamp gives a eye caching statement to any room, with long chrome arms suspended is a elegant criss cross pattern and finished at either end with half chrome bulbs. This modern design will stun and amaze guests in residential or commercial entry ways, stairwells and any vaulted ceiling. Bulbs not included. Bulbs sold seperately, Max Watt 25 W, Size E12, Type G45. Item No: 98408 Dimensions(in): W 6.0 x H 6.0 x L 4.6 Auckland Ceiling lamp is a simple single triangular shaped pendant in rustic black antiqued finish. 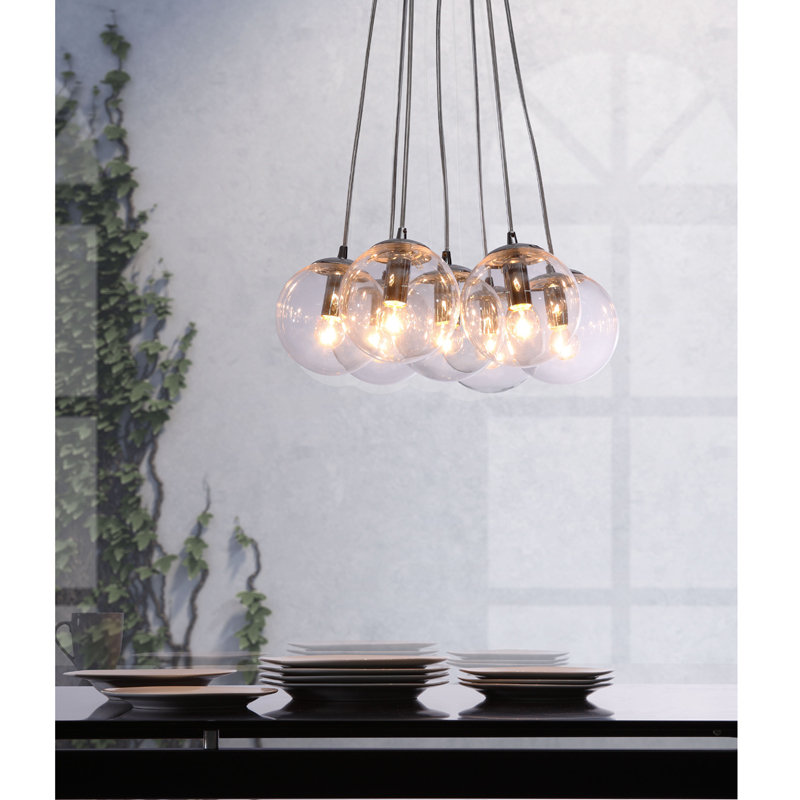 Pendant is perfect for bar or kitchen applications for just a touch of a rustic accent. 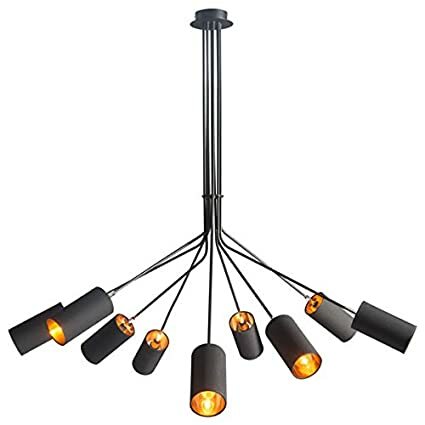 Item No: 56065 Dimensions(in): W 29.9 x H 61.8 x L 29.9 Mid-century inspiration results in this ten light modern masterpiece. Its black metal frame with a dimensional three-point design and clear glass globes make it so versatile. It will hang perfectly over a dining table & look stunning in an entry. 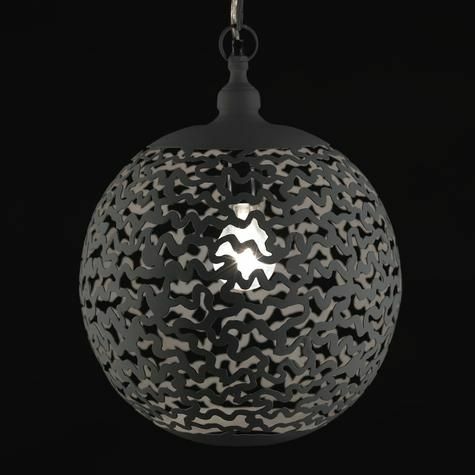 The perfect choice to beautifully illuminate any space. Item No: 56062 Dimensions(in): W 47.2 x H 43.3 x L 47.2 Form meets function. This modern chandelier with its attached scoop-like shades that rotate up and down or from side to side will throw light exactly where you need it. It will add intrigue to any room in your home or office space. Item No: 98256 Dimensions(in): W 5.9 x H 10.0 x L 5.9 For Alcatraz Island chic, try the Adamite Ceiling Lamp. A hanging nickel cage encloses a sleekly voluptuous 40 watt bulb. Hang it over a craft table or a breakfast nook and be glad you’re not on the inside. Item No: 50184 Dimensions(in): W 14.0 x H 15.0 x L 14.0 The Galileo Ceiling Light is an intriguing optical illusion. Like a perfect sea shell, swirling lines encase a rosy glow. Made of white plastic. Item No: 56064 Dimensions(in): W 43.3 x H 62.2 x L 43.3 It’s a modern marvel. Clear glass spheres of light extend dramatically from the corners of this hexagon-shaped chandelier. Its dimensional, open frame looks striking over a dining table. Faith ceiling lamp brings a fun approach to our faux concrete collection with 5 Edison bulbs suspen.. Item No: 56061 Dimensions(in): W 23.6 x H 23.6 x L 23.6 For the room that needs a statement piece. 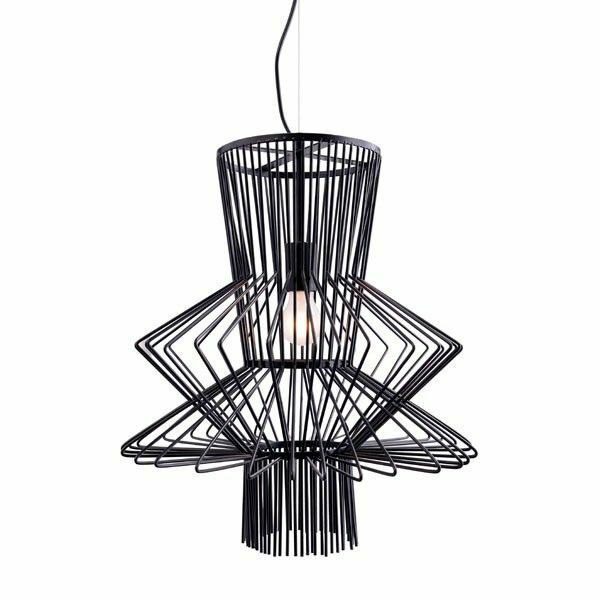 Our dramatic and daring three-tiered chandelier in sleek black metal will create a scene in an entryway, or over a dining table or kitchen island. 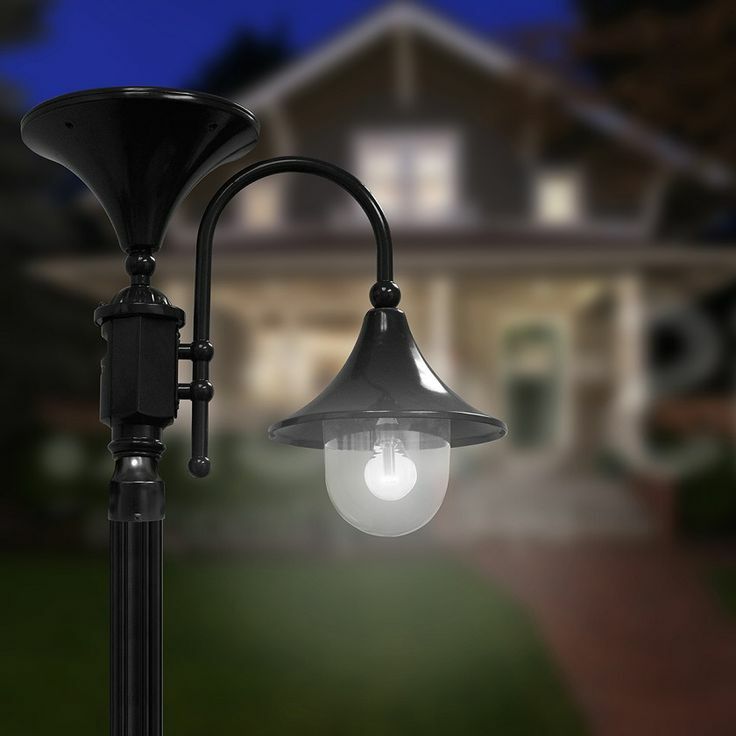 Bulbs attach brilliantly on the top and bottom of each rod to light up a large or small space. Item No: 50209 Dimensions(in): W 17.7 x H 23.6 x L 17.7 Daydream ceiling lamp has a large 2 level bell shaped shade. Shade material surrounds a metal architecture with an grey polyester woven thread zig zag pattern woven throughout pattern creating a soft, see through shade. Install in kitchens or day rooms, group over living and dining rooms and perfect for a softer look to your modern design. Bulbs not included. Bulbs sold seperately, Max Watt 60 W, Size E26, Type A19. UL approved and listed. Item No: 50202 Dimensions(in): W 12.0 x H 5.9 x L 10.0 Aspiration ceiling Lamp features a classic bowler hat style. Black felt hat has ribbon details and gold foil accents to inside of shade. Perfect for gentleman’s study or to add atmosphere to a bar or restaurant. Item No: 50207 Dimensions(in): W 8.7 x H 42.5 x L 8.7 Faith ceiling lamp brings a fun approach to our faux concrete collection with 5 Edison bulbs suspended by colored electrical cords in cool grey, yellow, red, orange and graphite. Hang in kids rooms, kitchen or over your bar area. Perfect for an industrial look for cafe’s or restaurants, hotel lobbies or public spaces. Faux concrete finish is in a warm grey tone. Bulbs not included. Bulbs sold seperately, Max Watt 25 W, Size E26, Type ST64. UL approved and listed. Item No: 50035 Dimensions(in): W 19.7 x H 19.7 x L 19.7 Like a blossom opening from a branch, the Tachyon Ceiling Lamp is harmonious sophisticationand made in aluminum finish. Bulbs not included. Bulbs sold seperately, Max Watt 100 W, Size E26, Type A19. The Fortune ceiling lamp is made of of light-weight faux concrete in a sleek pint sized shape. Faux.. Item No: 50106 Dimensions(in): W 19.7 x H 7.9 x L 19.7 When the Asteroids Ceiling Lamp balances metal and glass, it creates perfection. An adjustable height chrome base supports the glass shade. Comes in clear or red. Bulbs not included. Bulbs sold seperately, Max Watt 60 W, Size E26, Type G80 Frsoted White. UL approved and listed. Item No: 56014 Dimensions(in): W 13.4 x H 132.3 x L 13.4 Bohemin chic the Bald ceiling lamp will create style and drama with thin sheets of perforated gold metal mesh encapsulated a single light with elegant style. Gold finish to electroplated metal. Bulbs not included. Bulbs sold seperately, Max Watt 40 W, Size E26, Type A19. UL approved and listed.